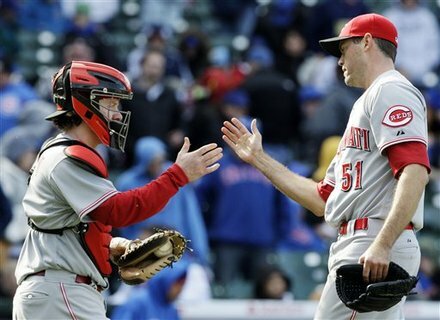 The Reds finally won their second series of the young 2012 season today when they picked on someone smaller than them in the Chicago Cubs. Johnny Cueto took the mound and provided 6.1 innings of five hit, two run (one earned) performance. He struck out seven and walked two. From there, Logan Ondrusek took over to walk a guy and strike a guy out before handing the ball over to Aroldis Chapman. Chapman finished out the seventh and also pitched through the eighth, giving up no hits and no runs, walking two and striking out one. Finally, our rarely seen closer, Sean Marshall gave up one earned run on one hit in the ninth, which was OK because the lead was two. He also struck out two. Drew Stubbs, Joey Votto, Jay Bruce, and Scott Rolen provided the RBI today. Stubbs’ 1-for-4 day with a walk continues a modest hot streak that makes it much more pleasant to watch his at-bats. Votto went 2-for-3 with two walks, bringing his league-leading total number of walks to 17. Dude’s rocking a .444 OBP. The win brings the Reds’ record to 7-9. Which isn’t that great, but on the other side, the loss brings the Cubs’ record to 4-12, so there’s some perspective for you. Tomorrow they take the day off before heading home to open a series with the Giants on Tuesday at 7:10. Mat Latos will take on the dreaded TBA. Posted in Chicago Cubs, Cincinnati Reds, Game Wrap.